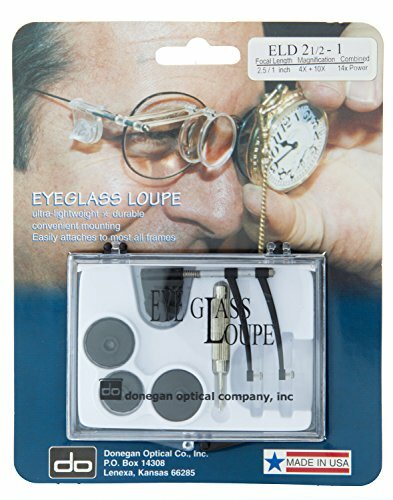 The Donegan watch and clock maker’s double-eye loupe is a set of two eye loupe magnifiers that attach to prescription glasses, align for magnification, pivot away when not in use, have optical glass, prismatic lenses, and are available in a variety of magnification powers (X) at specified focal lengths, or distance from object. This magnifier enhances the size and resolution of an object or image, and is commonly used for a variety of applications such as jewelry-making, watch-making, clock-making, needlework, electronic inspection, book-reading, print inspection, and stamp-collecting. This magnifier features two optical glass lenses that are ground and polished into prismatic lenses for quality and clarity. They are made of a lightweight (2.6 oz. ), durable material and are designed for comfort and utility. Changeable cams are included to fit eyeglass frames from 1/16” to 1/4” temple width. 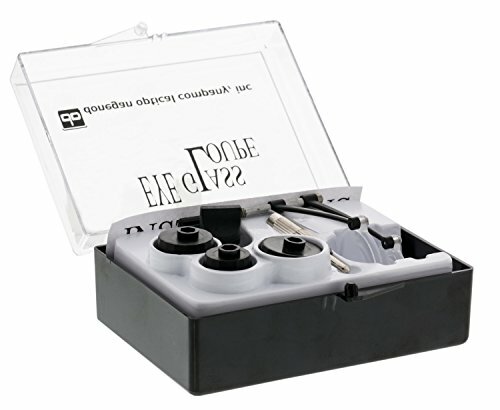 Eyeglass loupes clamp to eyeglass arms with ease, and are convertible from right to left temple mounting. 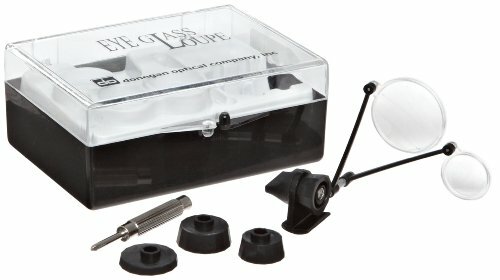 The eyeglass loupe comes housed in a hard protective carrying case. It has a one-year limited warranty. Diopter (D) is a technical term for the measurement of the light curvature and thickness of a lens. A dioptric number and a magnification number are not the same thing. Diopter strength represents a specific magnification power (X). For example, a 5-diopter provides 2.5X magnification (at a distance of 8”). Refer to the magnification chart for an illustration. The higher the diopter, the more magnification a lens can provide. As magnification increases, distance to the object (focal length), and field of view (diameter, or narrowness of view) decreases. Magnifiers and prescription eyeglasses have a diopter value, such as 1.5 or 2. The dioptric strength of an accessory lens, such as prescription eyeglasses or an eye loupe, must be added to the dioptric strength of the magnifier to calculate total magnification. Magnifiers are devices used to enlarge the visual appearance of an object or image. 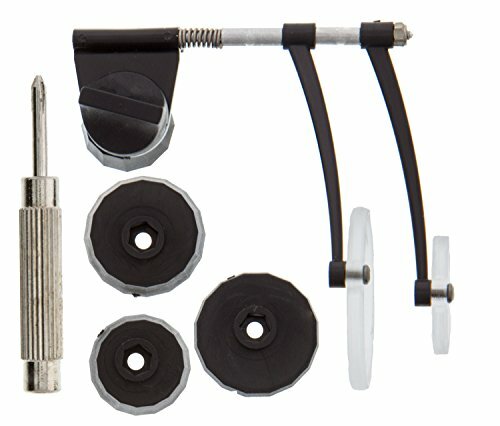 Magnifiers come in a variety of styles such as hand-held, headband, standing, clip-on, eye loupe, and those that hang in a necklace form, or fit in a trouser pocket. Magnifiers are commonly made of plastic or glass. They can have one or more lenses with varying magnification abilities, and can have a binocular configuration with a single lens, or two separate lenses. They are sometimes used with LED or fluorescent light sources to help control viewing capabilities. Magnifier ability is often expressed as magnification at a specific length. For example, 1.75X at 14” means that when a magnifier is held at 14” from a viewer’s eyes, the object will be magnified 1.75 times (X) its actual size. As magnification increases, viewing areas and the focal length decreases. Magnifiers sometimes have a diopter number, expressed as + or - D, which is a measurement of strength (or power) of the lens. Some magnifiers are marked with a dioptric number on the lens. A high diopter number has a higher magnification than a low diopter number. Aspheric magnifiers, unlike spheric magnifiers, produce a sharp image to the edge of the lens for less distortion. Magnifiers are widely used in jewelry inspection and fabrication, watch-making, needlework, artwork, reading, print inspection, and stamp-collecting.